Dr Julia Reid MEP, a research biochemist by profession with a PhD in Pharmacology, has been appointed as UKIP’s Health Spokesman by Steve Crowther, the party’s interim leader. Dr Reid has a considerable amount experience in the NHS and was, for over a decade, the Laboratory Manager of the Diabetes and Lipid Research Laboratory at the Royal United Hospital in Bath. This comes after Suzanne Evans, UKIP’s previous Health Spokesman, announced that she will be taking a break from active politics to recover from her cancer treatment. 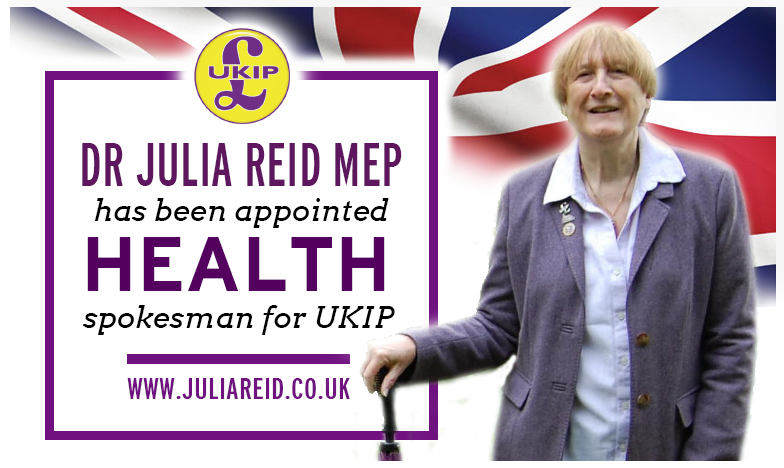 With regards to her appointment as UKIP’s new health spokesman, Dr Julia Reid MEP said: “As someone who has worked within the NHS for a considerable amount of time, I can say with the utmost sincerity that I’m incredibly proud of our NHS and that I’m very honoured to have been appointed as UKIP’s health spokesman. Our NHS is world class, it’s a national treasure, one that sets us apart from the rest of the world“. Dr Reid will keep her role as Environment Spokesman as well.